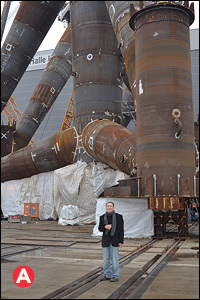 Professor Christou (MSE) at the base of an offshore wind turbine in Germany. In 2013, University of Maryland professors Aris Christou (Departments of Materials Science and Engineering [MSE] and Mechanical Engineering [ME]) and F. Patrick McCluskey (ME) received a Maryland Offshore Wind Energy Challenge Grant to assist the State in its efforts to develop the technology and deployment strategy necessary for establishing its wind power industry. The Clark School faculty members are particularly focused on issues of reliability and degradation. Here, Christou reports on the progress of the project. Among renewable energy sources, wind energy is the most immediately available, and it is a reality in some countries like Germany, Denmark and the U.K.
Development of large wind turbines on a vast scale first took place in the United States and Denmark following the 1973–1974 Arab Oil Crisis, supported mainly by the U.S. Federal Wind Energy Program. In more recent years, wind energy has experienced impressive growth in some northern European countries by going off shore. The State of Maryland is committed to the development of offshore wind energy, as demonstrated by the passage of the Maryland Offshore Wind Energy Act of 2013. How-ever, cost and reliability remain major issues to overcome. 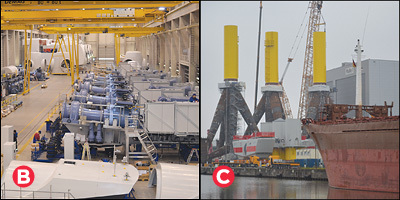 It has been estimated that the cost of an offshore turbine operation is ten times that of its land-based counterpart. This makes the role of reliability crucial. At UMD, we’re leveraging our extensive expertise in energy, reliability, physics of failure, corrosion, environmentally induced degradation, and wide band gap semiconductor power electronics to assist the state in achieving its objectives. My research, funded by the State of Maryland, will provide a power predictive tool and definite reliability figures for turbine designs being considered for implementation in the Atlantic Ocean. Prior and current work carried out in Denmark and Germany will assist us in obtaining a deeper understanding of the reliability of offshore wind turbines. For this very reason, I became part of a delegation from the State of Maryland which visited the two countries in November 2013. The trip illustrated the manufacturing and installation issues faced by each developer and industrial supplier. Our conclusion was that the reliability of wind turbines must be improved because of the difficult accessibility of marine locations, which raises the cost of delivered energy to unacceptable levels. Photos from our visit illustrate the magnitude of both the technology and the challenges of maintaining an offshore wind turbine grid. The tripod-like base alone of the type shown (A, C) is about 91m (300') tall, and each of its blades (D) is up to 30m (100') long. 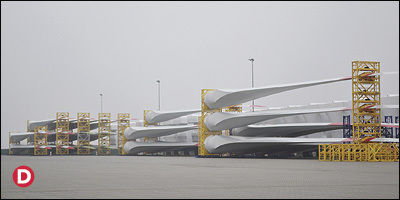 The largest turbines have a diameter of 126m (413'). In contrast, the wingspan of an Airbus A380 is 80m (about 262.5'). Manufacturing (B) is actually the least problematic part of the process. Assembly in the open ocean is dangerous and requires specialized equipment and personnel, as well as the erection of temporary construction platforms. The turbines face life in a harsh environment. Their massive size translates into more surface area that can be attacked by corrosion, fatigue, or mechanical crack propagation. Each contains over 2000 sensors, generating a constant stream of data that must be analyzed on shore to monitor its performance. If one turbine fails, the entire grid may be affected, resulting in power fluctuations–a problem that can’t be resolved by simply shutting down the bad unit. Our research is now producing some key results, by incorporating our knowledge of physics of failure and statistical techniques. We can now predict root cause of turbine failure, as well as assess the criticality of each failure. The degradation models we have previously developed for corrosion and corrosion-fatigue will assist us in assessing the dynamic states of the turbines. We are currently implementing a Monte Carlo approach in order to understand device and component faults and their effect on grid performance.